For the Genii commander from Stargate Atlantis, see Acastus Kolya. For the village in Iran, see Kolya, Iran. For the Russian nickname, see Nikolay (disambiguation). 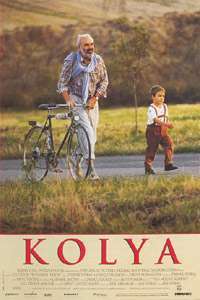 Kolya (Czech: Kolja) is a 1996 Czech drama film about a man whose life is reshaped in an unexpected way. The film was directed by Jan Svěrák and stars his father, Zdeněk Svěrák, who also wrote the script from a story by Pavel Taussig. Kolya earned critical acclaim and won the Academy Award for Best Foreign Language Film and Golden Globe Award for Best Foreign Language Film. Due to a concurrence of circumstances, she has to leave behind her 5-year-old son, Kolya, for the disgruntled Czech musician to look after. At first Louka and Kolya have communication difficulties, as they don't speak each other's languages and the many false friend words that exist in Czech and Russian add to the confusion. Gradually, though, a bond forms between Louka and Kolya. The child suffers from suspected meningitis and has to be placed on a course of carefully monitored antibiotics. Louka is threatened with imprisonment for his suspect marriage and the child may be placed in a Russian children's home. The Velvet Revolution intervenes though, and Kolya is reunited with his mother. Louka and Kolya say their goodbyes. Bachelor Louka ends up fathering a child with his girlfriend - perhaps a replacement for lost Kolya - and regains his position as a virtuoso with the philharmonic orchestra. The film was successful on a limited release from 24 January 1997 and had taken about $5.73 million by 11 July that year after an opening weekend gross on three screens of $37,795. ↑ Thomas, Kevin (1997-01-24). "Father and Son Team Up in 'Kolya'". Los Angeles Times. Retrieved 2012-06-03. ↑ Maslin, Janet (1997-01-24). "What a Difference a Boy Makes". The New York Times. Retrieved 2012-06-03. ↑ "Kolya". Chicago Sun Times. 1997-01-27. Retrieved 2012-06-03. ↑ Guthmann, Edward (1997-09-12). "FILM REVIEW -- Charming `Kolya' Has Magic Touch". San Francisco Chronicle. Retrieved 2012-06-03. ↑ Thomas, Kevin (1997-01-24). "A Heart-Tugger With a Czech Twist". Los Angeles Times. Retrieved 2012-06-03. ↑ King, Susan (1997-01-28). "Jerry Maguire Ahead of Pack--Barely". Los Angeles Times. Retrieved 2012-06-03. ↑ Kolya: Box Office, IMDB, Undated.Retrieved 24 January 2016. ↑ Box office / business for Kolya (1996), IMDB, Undated.Retrieved 24 January 2016.